Razor fish, often referred to as razor clams, belong to a family of shellfish found in most of the world's coastal regions. Their shells are more fragile than those of most other shellfish, so they have to be harvested by hand rather than with the big dredges used for most other clams. This makes them costlier than other varieties, so they're seldom harvested commercially. However, their flesh is unusually sweet, making them a favorite with hobby clam diggers. They are a versatile ingredient in seafood dishes. If you live in an area where razor fish can be harvested, check with local authorities to ensure the local clams are safe to eat. Some areas also have stringent bag limits. Dig the clams at low tide, keeping them alive in a bucket filled with sea water. Once you've got your limit, fill a cooler with ice and cover the ice with a sheet of newspaper dipped in salt water. Put the clams on the paper and get them home to your refrigerator as fast as possible. Keep them wrapped in the wet paper no longer than overnight before cleaning them. Place the clams in a bowl and pour boiling water over them. After five to 10 seconds, the shells will open. Drain them right away and put the clams into cold water to keep them from cooking and becoming tough. Peel the long, cylindrical body from the shell and snip off the tough digging end from the foot of the clam. Split the rest of the razor fish lengthwise with a knife or scissors and remove everything that isn't plain, white flesh. Most cooks separate the foot from the main body to make it easier to clean. 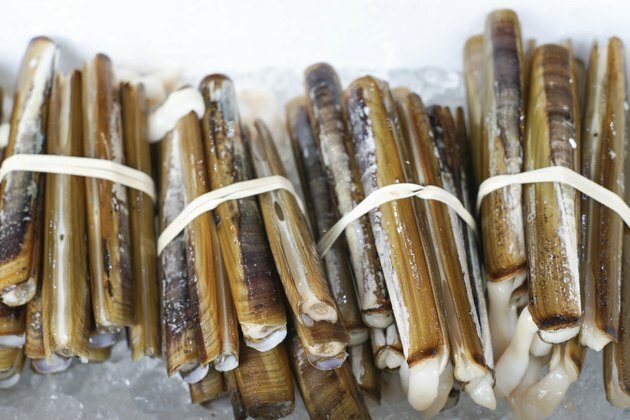 The meat of razor clams is unusually sweet, resembling lobster more than other clams. Physically, the cleaned clam makes a flat sheet of flesh somewhat like a squid. In general, the rules used for cooking squid apply to razor clams as well. It can be cooked very quickly to a pleasantly chewy texture or it can be slow-cooked until the flesh becomes tender. It can be used in recipes calling for either squid or clams since razor fish recipes are relatively rare. Cut the razor fish into long strips and stir-fry them quickly with garlic, ginger, five-spice powder and green onions. Serve them over rice and stir-fried vegetables. Alternatively, saute the strips quickly in butter and garlic and serve them with chopped parsley and lemon wedges. Lightly oil cleaned razor fish and score the flesh lightly in a crosshatch pattern with the tip of a knife. Grill them quickly over high heat, then slice and serve. Bread or batter strips of razor fish and fry them crisp and golden or add them to soups and chowders.